No matter the season, your senior care services clients may want to plan a vacation. 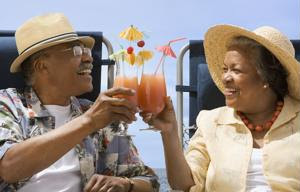 No matter the season, your senior care services clients may want to plan a vacation. Taking a holiday is a great way for people to relax and unwind, have new adventures and explore new sights. Pack light: Heavy suitcases will weigh seniors down both literally and figuratively. Instead, suggest that they opt for light packing, using just a carry-on if possible. This will make it easier to get around, and your clients won't have to worry about lugging extra bulk around with them. Bring enough medications: If your clients take any medications, be sure their prescriptions are refilled prior to the trip and that they pack enough to last them throughout their vacation. It can also be helpful to purchase a pill box with days of the week on it so your clients will know exactly what to take each morning or evening. Prepare documents: Before taking off, help clients get all of their documents in order so they are easily accessible. If they're going abroad, check that their passport is up to date. It's also helpful to have clients' boarding passes, Medicare and insurance cards, driver's licenses and any medical statements from a doctor all secure in one easy-to-reach place.